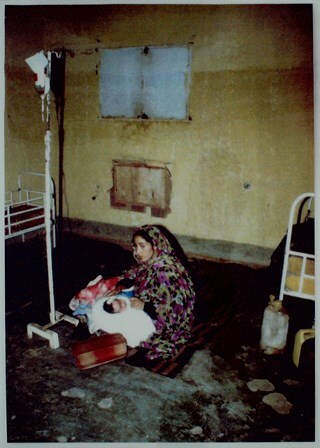 Sahrawi women and child (unnamed) at hospital, 1990s. Western Sahara Campaign publicity material. WSC archive, Box 4. Copyright WSC. To coincide with World Refugee Day (20th June), today we are highlighting the archive of the Western Sahara Campaign available to the public at Archives & Special Collections, SOAS Library. World Refugee Day is a yearly event dedicated to raising awareness of the situation of refugees throughout the world. The Western Sahara conflict is a longstanding dispute in North Africa between the state of Morocco (which views the disputed-territory of Western Sahara as part of its Southern Provinces) and the Polisario Front of the Sahrawi people (who view the Moroccan government as an occupying force). Following the end of Spanish colonial rule in what was known as ‘Spanish Sahara’ in 1975, hostilities broke out between the Polisario Front, which had proclaimed the Sahrawi Arab Democratic Republic (SADR) in the territory, and the governments of Morocco and Mauritania who had annexed and partitioned the colony following decolonisation. In 1979, Mauritania withdrew from Western Sahara under pressure from Polisario; later recognising SADR sovereignty. However, conflict continued between the Sahrawi independence movement and Morocco during the 1980s, until a cease-fire was negotiated between the two parties in 1991. A proposed referendum to determine the future of the territory failed to materialise after disputes between the two parties over the qualification of voters. Today, Morocco retains control of roughly 75-80% of Western Sahara, while Polisario retains effective control of the remaining 20-25% of the territory. An ongoing peace process has to date failed to result in a permanent resolution to the conflict. The war in Western Sahara led to a large number of refugees from the Sahrawi community. A significant proportion of these were displaced after fleeing the initial advance of Moroccan forces into the territory in 1975. The result has been one of the world’s longest-lasting refugee and humanitarian situations. In 2005, the UNCHR estimated around 90,000 refugees were housed in the refugee camps, administered by Polisario, in the Tindouf Province of Algeria. However, Polisario disputes this figure as an underestimate, claiming there are currently over 150,000 Sahrawi refugees in Algeria. Other communities of refugees from Western Sahara are located in Northern areas of neighboring Mauritania. The exact numbers of Sahrawi refugees outside Western Sahara has been an import issue in the intermittent peace process between Polisario and Morocco, as it is seen as having the potential to impact any future referendum on the territory’s future status. 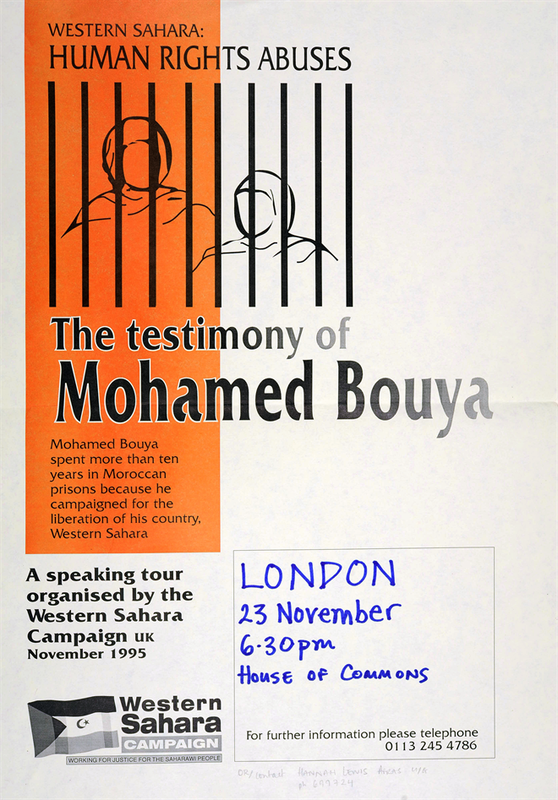 Poster for meeting of the Western Sahara Campaign, 1995. WSC archive, Box 3. Copyright WSC. The Western Sahara Campaign is a British based organisation working to generate political support in order to advance the Saharawi people’s right to self-determination and to promote their human rights. The Sahara Action Committee was formed in London in the late 1970s after the occupation of Western Sahara by Morocco in 1975. This led to the establishment of the Western Sahara Campaign in 1982, which was formally launched in 1983. It set up an office in London and for some years in Leeds, with a part-time co-ordinator. The Campaign primarily seeks to achieve this by lobbying Foreign Office and UN officials, MPs, MEPs, Trade Unions and the British media, encouraging them to increase international pressure for a peaceful resolution and hold Morocco accountable for alleged Human Rights abuses. The Western Sahara Campaign is also a member of Western Sahara Resource Watch, an international network of organisations and activists who campaign against companies working for Moroccan interests in Western Sahara. The Western Sahara Trust, connected to the Western Sahara Campaign, is a registered charity which aims to carry out charitable purposes for the relief of Saharan people in need as a consequence of conflict or poverty, in particular working among the communities living in the Tindouf refugee camps in Algeria. The Western Sahara Campaign archive is made available to the public here at Archives & Special Collections, SOAS Library. SOAS Library collects and preserves the archival records of British-based pressure groups and nongovernmental organisations (NGOs) who work or campaign on issues relating to the Global South. The archive collection at SOAS contains a wealth of information on the longstanding conflict in Western Sahara and the humanitarian consequences of the war and occupation for the Saharawi people. The records also provide a unique documentation of the response to the conflict within Britain and elsewhere. The archive collection comprises the organisational and campaign material of the Western Sahara Campaign including: lobbying material; correspondence with MPs and MEPs; press releases; newsletters and United Nations Security Council reports. The collection also contains material from international human rights organisations, including reports on Sahrawi refugee camps and Sahrawi refugees, photographs and slides of refugee camps, press cuttings and reference material regarding the Western Sahara conflict, including books and publications relating to Sahrawi refugees. The Western Sahara Campaign collection holds obvious value to students and researchers in North African studies, as well as the fields of peace and conflict studies, refugee studies, and development studies, but it will also be of significant interest to researchers in other disciplines, including those looking at the role of nongovernmental organisations and political campaigning in British society.